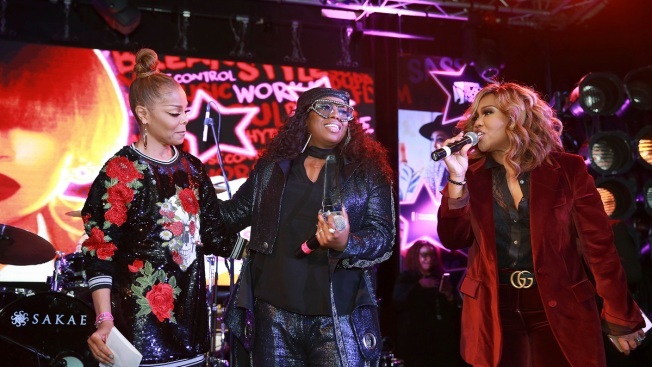 Singers Janet Jackson, Missy Elliott and producer Mona Scott-Young attend the ninth annual Essence Black Women in Music event at the Highline Ballroom on Thursday, Jan. 25, 2018, in New York. Missy Elliott knew she was being honored by Essence — but not who was giving her the accolade. So there was plenty of emotion when close friend Janet Jackson not only handed her her trophy but praised her talent. "Some rhyme, some rap; some act, some choreograph; some write hit songs; some create whole new sounds. Some women are able to make her mark in some of these fields; but there's only one woman who has made her mark in all of these fields," Jackson told a packed crowd on Thursday night. "Not only have you made your mark, but she's done so with boldness and courage." Elliott — whose hits include "Work It" ''Get Ur Freak On" and "One Minute Man" — began to cry during Jackson's tribute. The two shared a long embrace when Elliott went on stage for her "Visionary" award from Essence at the magazine's annual pre-Grammy event celebrating black women artists. "That was a surprise," an overwhelmed and teary Elliott said. "I've known Janet over a decade and this is not just ... someone I do music with. I can call Janet any time of night . and she will listen," she said. "The times that I may have felt like giving up, she's always gave me an encouraging word." Elliott, who has created hits for artists ranging from Aaliyah to Jackson to Ciara, almost turned the evening into a church sermon as she thanked God and used her own success story as testimony to never give up. She noted that some in the industry didn't think she could be successful — at times because she was a woman and a producer, at others because she didn't look like what was seen as traditionally beautiful. She recounted that one time she was even replaced her with someone who they thought was. "I want all of you women in here to know that you're beautiful," she said. "You gotta believe in yourself. Because there are going to be times that people tell you you can't do it or you don't look the part . but I am a walking testimony." She also celebrated her heritage and thanked Essence, the media company dedicated to black women. "I wouldn't wanna be any other color but black," she said to the cheers of the crowd. "I'm black and I'm proud. There's something about our DNA that can't be taught, it comes from a different place." She added: "Essence magazine has over the decades shown me what strong power black women look like and I appreciate that." Among the celebrities in attendance were Janelle Monae, T.I. and "Orange Is the New Black" actress Danielle Brooks who turned out in an Adidas blue track suit in honor of one of Elliott's many fashion looks over the years. Performers Leikeli47 and two-time Grammy nominee Rapsody performed in tribute to Elliott. The Essence event is just one of dozens being held around New York City ahead of Sunday's 60th annual Grammy awards, to be held at Madison Square Garden.